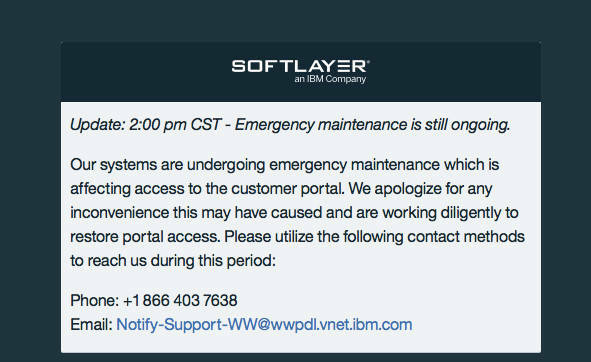 Updated An extended outage over at IBM's Bluemix SoftLayer portal has customers fuming – and they say there is no way for them to tell Big Blue about it. A Reg reader whose biz runs more than three dozen servers within the SoftLayer cloud told us the platform has been out all day and the management portal website has been inaccessible. In addition, the @SoftLayer twitter account and Facebook pages that had been referenced as support links both lead to dead or inaccessible pages. A quick check by The Register found that, as of Thursday morning in San Francisco, the portal was still down and the support links went to deceased pages. The Register asked IBM to explain itself, and we've yet to hear back. Coincidentally, minutes after our inquiry was sent, the SoftLayer status page was magically restored and the Twitter and Facebook links now direct to IBM's IaaS accounts. It was the Reg wot won it? Well, if you want to be generous to IBM, the portal was supposed to be updated today, though we're told the outage occurred prior to the start of the announced downtime. Our tipster said that these sorts of blunders and bouts of unreliability have become an all-too-common occurrence since Big Blue took over SoftLayer and rolled the service into the BlueMix platform-as-a-service offering. "Since IBM came along there have been loads of outages, planned and otherwise," our reader in the field told us. "In the three years of service prior to this we had only one outage, in the six months after they took over we have had one outage that knocked out their AMS [Amsterdam] data center for four hours, [and] their entire global virtual server platform has had to be rebooted three times on separate occasions." Hopefully this revamp is a sign that service and support are back up for the BlueMix/SoftLayer customers who have had to deal with these outages. Yesterday, we had a planned update to extend our feature set that caused our user interface portal to intermittently go offline. All production workloads continued to operate normally. Some customers may have experienced intermittent issues when trying to access the portal or perform any change function in the system such as new instances. The issue was resolved as of yesterday afternoon.